Eureka 62731B-2 in only one dust cup filter to a pack. Our Eureka 62396-2 comes with two dirt cut filters, so you always have a backup. 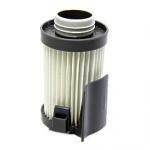 Eureka Filter - Hepa Vacuum Cleaner Filter DCF-10 for the Optima and Series 430 Eureka(431A). The 62396 or DCF10 filter is a HEPA type vacuum filter for the bagless Dust Cup Eureka Optima Series Vacuum Cleaners. I appreciate being notified when the shipment was delayed and then notified again when it was shipped. Good work! The website was very easy to navigate & had the cheapest price for the product that I was looking for. The product arrived a lot sooner than I thought it would. I will use this website again the future! Thank you for your great service!